The title is not really asking the readers to indulge in serious overwhelming mental exercise. However, the mobile developer who has any wish to get involved with developing an on-demand delivery application catering to salon and spa services, need to identify the major challenges that come with such apps. However, salon applications are not all about daring the developers and the owners. There are specific benefits associated not only for the final users but for the owners as well. Recent reports have already given an insight into the current market trends where more and more users prefer mobile applications to complete the major part of their day-to-day task especially those pertaining to physical grooming and salon services right within the comforts of their homes. Few popular on-demand service apps such as UrbanClap are already drawing major attention recently owing to the range of services that their hired professionals have in their kitty to offer. So, having established the fact that the salon booking and other such on-demand service apps are in, it is time to find out the challenges that bother those who are associated with Spa and Salon business. Retaining customers with prolonged engagement to sustain the hard-core competitive market where most apps fail miserably to establish the lasting relationships with their end users. Management of appoints and schedules especially during rush hours are inevitable to cause ample confusions. Saving time and avoiding overloading of available resources is a major challenge for such app owners. Raise staff productivity through proper management of appointments and schedules is not an easy task especially if there is an availability of more than one branch along with ‘at-home’ services. Confusion and mismanagement reduce staff productivity. Acquire widespread recognition through applications is only possible for salons and spas something which is challenging for most businesses if app implication is not duly recognized by the owner. Missing out a prime location is one major factor detrimental to gaining brand awareness and visibility. Link of service providers on checking out with careful avoidance of few cliché comments such as “Would you like to book your next appointment?” is advisable to avoid increased bounce rates and entail maximized customer re-engagement for the app. One-stop option to beat the competition with ample offers and incentives topped up with quality service can be applied to beat off other options in the market. This is the most challenging task amongst all. Enhance clients with app-based knowledge must be given priority to enable them with seamless navigation across the designed application. Always be prompt enough to respond to their inquiries while carrying them across the systematic process yet not displaying too pushy nature is challenging by itself. Challenges are exasperating but not everything is blue with on-demand salon booking apps. There are few specific factors, which prove a boon to both the owner as well as the end user. Proper management of schedules to avoid draining off resources and ensuring quality service to the clients is achievable through a web-based dashboard by the salon appointment software. Assigning tasks and monitoring staff performance is possible with application inclusive of this feature. Customer retention is maximized through prior informing them on available time-slots to acquire service across the salon application retains your prospective customers where options are endless. Market expansion with opportunities wherein the application serves as an important marketing and promotional tool for expanding app user base and develop the brand image along the process. Customer data management and ensuring security is of utmost importance for such apps since any mCommerce or on-demand service provider applications stores endless customer data. Also, a bond can be established through forwarding regular updates pertaining to salon service. Long-term benefits are something we all aspire from our venture undertakings. 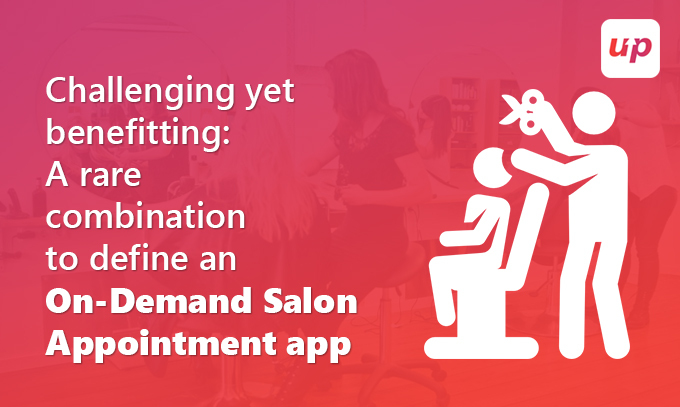 And, salon appointment booking software powered by an app is sure to fetch maximum return on investments. Automatic appointment reminders for the forgetful customers and avoid any form of difficulties if they turn up on the wrong date for their service. Also, avoidance of no-shows is possible with reminders through emails and or SMS alerts. Safe and easy payment options through different and trustable payment gateways incorporated into the application framework offer an easy mode of completing transactions instantly while booking appointments and remains relaxed of not losing out data to invaders. Personalized service with tempting offers through extensive research made on geo-location based prospective clients along with inputting suggestions pertaining to their specifications and offers to keep them enticed is possible through such apps. 24/7 availability of service with salon booking application to allow clients from scheduling and or rescheduling appointments, scan through the services and or seek any help from the executives during their leisure. Security and cost cutting such as safeguarding stored data into the system if it at all system crashes, however not possible due to the presence of the application software. Stringent measures observed to secure stored data and avoid any malware infiltration to maintain customer loyalty. Also, avoidance of double booking and cost incurred through manual maintenance of accounts and inventory management. Social media linkage, which is available with all kind of applications, is yet another platform to locate your application and creating the brand at the same time. Linking the online appointment software to the Facebook page will redirect users to the specific application. Any service provider must aim at rendering experience to its users than a mere customer service. Salon and spa services with mobile apps have been specially designed to give quality service to the many users and hence no compromise must be made when you enter the service industry. Afterall, it is the quality that measures a service rendered and salon-booking applications are designed with this very intention to groom their clients and beautify their locks within the comforts of their home or at their branch without facing any booking hassles. Top-rated mobile application development companies such as Fluper is quite experienced with developing similar apps proven through the apps lying in its portfolio. So, if you care at all to overcome the app development challenges yet obtain the benefits even for your end clients, then you know whom to hire.